In the September 2008 issue of Cookie magazine, a kind of parenting magazine for mothers who can still fit in their skinny jeans, I came across this small ad from the upscale retailer Lord and Taylor on behalf of a new charity called Cookies for Kids’ Cancer. The ad was one of seven on a single page; the kind the sales staff bundles together and sells for a bargain rate. So I automatically assumed that maybe Cookie magazine had put it together. After all, no charity would dare suggest that the purchase of a $3 cookie would actually save a human life. It’s exploitive and, well, a lie. And, critics be damned, cause-related marketing is not about lying. September is National Childhood Cancer Awareness Month. 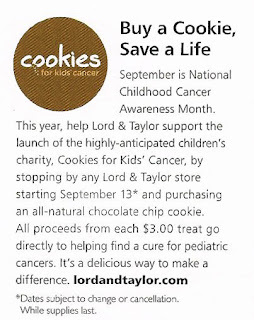 This year, help Lord & Taylor support the launch of the highly anticipated children's charity, Cookies for Kids' Cancer, by stopping by any Lord & Taylor store starting September 13th* and purchasing an all-natural chocolate chip cookie. 100% of each $3 treat goes directly to helping find a cure for pediatric cancers- it's a delicious way to make a difference. *Event subject to change or cancellation. While supplies last. OK, maybe Lord and Taylor did this. support, will make the letter "C" stand for COOKIES and not cancer. The campaign is cute enough. There are a few children’s cancer charities out there, but none are nationally prominent in the United States. A new one with a smart mission and good marketing might be able to make good headway. Lord and Taylor is venerable (even ancient) retailer stateside, so a cause relationship with them is a nice coup for a startup charity. But if Cookies for Kids’ Cancer sanctioned these ads, they’re getting their cause-related marketing off on the wrong foot. Someone really decided to put on their thinking cap, great going! It’s fantastic to see people really writing about the important things. This is a question for the webmaster/admin here at causerelatedmarketing.blogspot.com. May I use part of the information from your post right above if I provide a link back to this site? Yes, you may use material from this or any post if you provide a back link. I have a message for the webmaster/admin here at causerelatedmarketing.blogspot.com. May I use some of the information from this post above if I provide a backlink back to your website? You may quote from the post if you include a backlink.